(Bloomberg Opinion) -- Citigroup Inc. fired the starting gun on Wall Street earnings on Monday, and below some of the key headline figures, it’s not what investors were hoping to hear about its biggest trading business. Sure enough, market gyrations in the fourth quarter and executives’ warnings of just how tough trading was shaping up to be had set the scene for a dismal quarter across the industry, particularly in bonds. 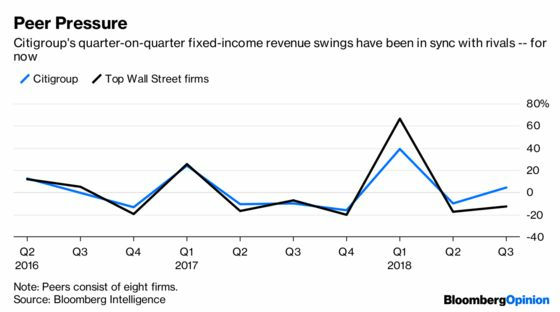 But Citigroup’s 21 percent decline in fixed-income revenue seems more than just a blip — it’s the worst result in seven years, and the unit is trailing its treasury and trade solutions business for the first time since 2011. Moving cash around for companies and helping them manage their funds is proving resilient against trade tensions that are gripping the world, Citi’s numbers show. The slowdown at the firm’s trading engine should have investors questioning whether the bank’s troubles signal similar problems for its peers or whether they are indicative of deeper woes specific to Citi. Those bracing for dismal results from other Wall Street trading houses ought not to despair just yet. Just three months ago, shareholders had been cheering Citi’s latest fixed-income rebound; the uptick in third-quarter figures were the first yearly increase for the unit since the start of 2017. It wasn’t to last. Chief Financial Officer John Gerspach, presenting the last set of Citi results before he retires, had one word to describe what went wrong in fixed income in the fourth quarter: “Everything.” What started as a difficult period in G10 rates spilled over to spread products — the activities that combine credit, municipal securities and securitized markets. And foreign exchange was not immune either, he said. Gerspach confirmed a Bloomberg News report that the bank had set aside reserves for a loan to an Asian fund whose foreign-exchange wagers went awry. The CFO declined to elaborate on the specifics of the client and the trade, telling journalists there was “nothing unusual” in the potential losses and that trading was within limits. Still, excluding that loss, the fixed-income unit would have experienced a decline in revenue in the mid-teens, according to Gerspach. That would have been closer to the 9 percent contraction forecast by analysts surveyed by Bloomberg News. Overall, fixed-income trading revenue should decline 3 percent at the top U.S. firms, they estimated before Citi’s announcement. What may be more telling about the potential foreign-exchange loan loss is the reorganization that followed it. Citi took the foreign-exchange prime brokerage unit out of the currency trading division and placed it under the oversight of its prime finance and securities services unit. Described by Gerspach as an administrative decision, “processes” are better on the equities side, he said, without elaborating. That may sound procedural, but there may be more behind the shift than meets the eye. Long one of Citigroup’s strengths, the old Salomon Brothers franchise has experienced at least two big reorganizations of its fixed-income leaders in the past 18 months. That changing of the old guard in commodities and spread products has coincided with a rocky patch. Citigroup CEO Michael Corbat’s task has been to make the bank less risky, though it’s not clear it has worked out in its trading businesses. As my colleague Stephen Gandel has pointed out, by at least one measure the bank’s overall trading activities have been riskier than those of its rivals. The value of what the bank could lose in its trading book on any given day outpaced that of JPMorgan Chase & Co. and Goldman Sachs Group Inc. through the third quarter. What’s clear is that the fourth-quarter trading performance won’t reverse itself easily. Equities revenue would have dropped, excluding the effect of a loss that didn’t repeat itself. Markets have generally yet to fully recover in 2019, according to Gerspach, as trade tensions continue to create uncertainty in the financial economy. Getting the business right will be that much more important.